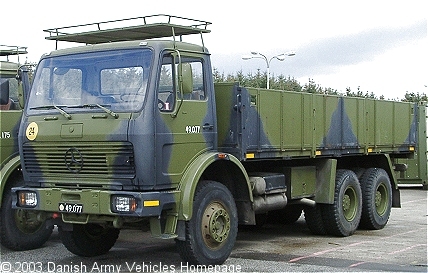 Danish Army Specific: The Mercedes 2626 was first delivered in 1977. Primary use is cargo transportation in the logistic battalions. Besides GS-trucks a tipper version was used. Now superseded by the Magirus Eurotrakker. Historical: The 2626K along with 1617, 1619, 1632K and 1719K was introduced in 1973. Length: 8.40 m (327 inches). Height: 3.08 m (120 inches). Engine: Own 8-cylinder, type OM 402, 12.760 cm3 (778 cubic inches). Additional: Servo assisted steering. Some mounted with Sepson 10 ton winch, type 18-06-B-H1 and some with HIAB-FOCO 3 ton crane, type 550-3.